Commenting or giving feedback is an essential component for portfolio work. 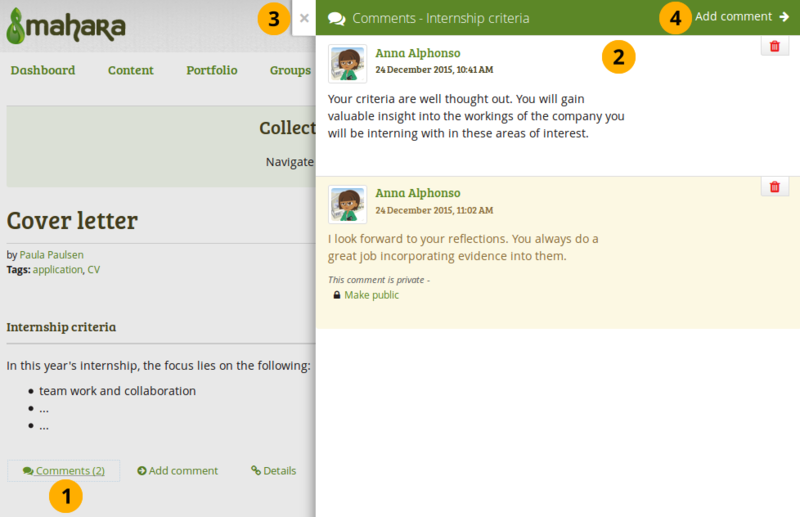 You can give feedback not only on individual artefacts but on entire portfolio pages. journal entries: when editing a journal entry. “Feedback” and “comments” are used interchangeably. It can be argued that feedback and comments denote different qualities of responding. 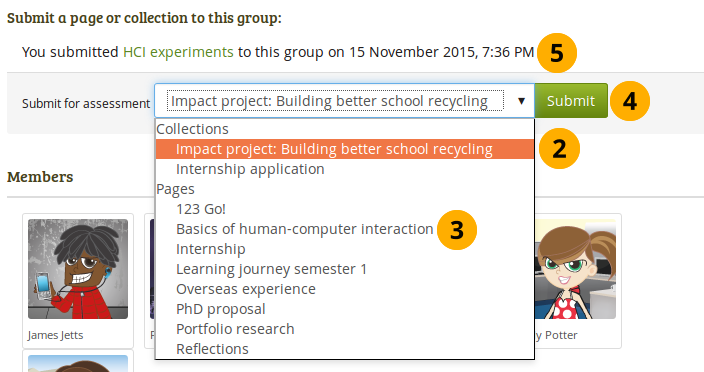 From Mahara 15.10 on, “comments” are used throughout instead of having a mix of “feedback” and “comments”. You can see the comments left so far at the bottom of each portfolio page or the artefact page that contains the artefact’s metadata. The profile picture and name of the author of the comment are shown. The name links to the author’s profile. You can see when the comment author wrote the comment and also when the last change to it was made. If comment or portfolio authors decide to remove comments, they are marked as such. Deleted comments retain the section “Comment removed by author / owner” if more comments come after them as they could have been referenced. Without that indicator, some conversations may not be easy to follow as context would be missing. If no additional comment comes after a deleted one, the deleted comment is removed entirely. If a deleted comment needs to be retrieved, it can be undeleted in the database as comments are not deleted from the database itself, but only set to be hidden. 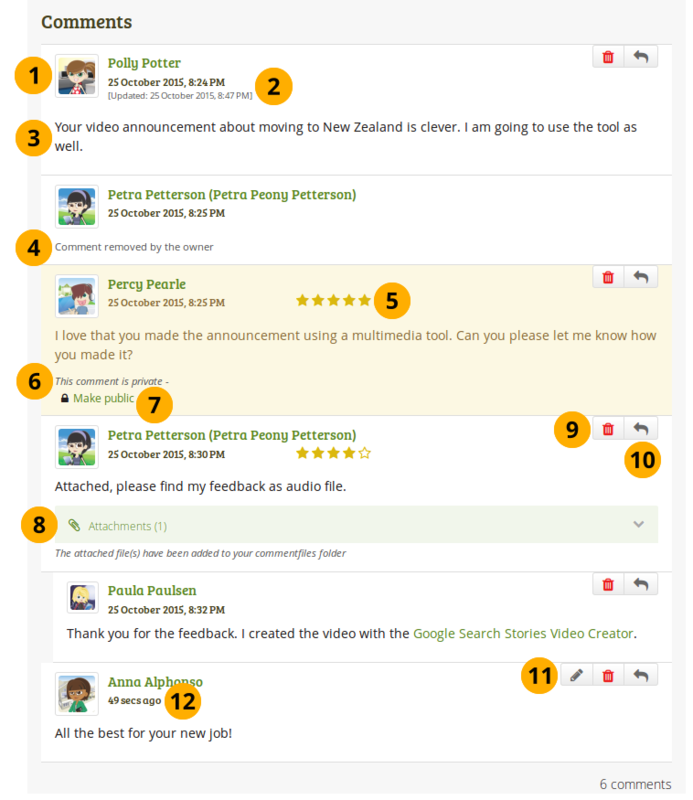 Comments can contain a rating which shows quickly how well the person commenting likes your page or artefact. This feature is only available if the site administrator turned it on in the extensions. As page / artefact owner you see all comments. A comment marked as private by the comment author is only displayed to you and the person commenting. You or the comment author can make a private comment public by clicking the Make public link. 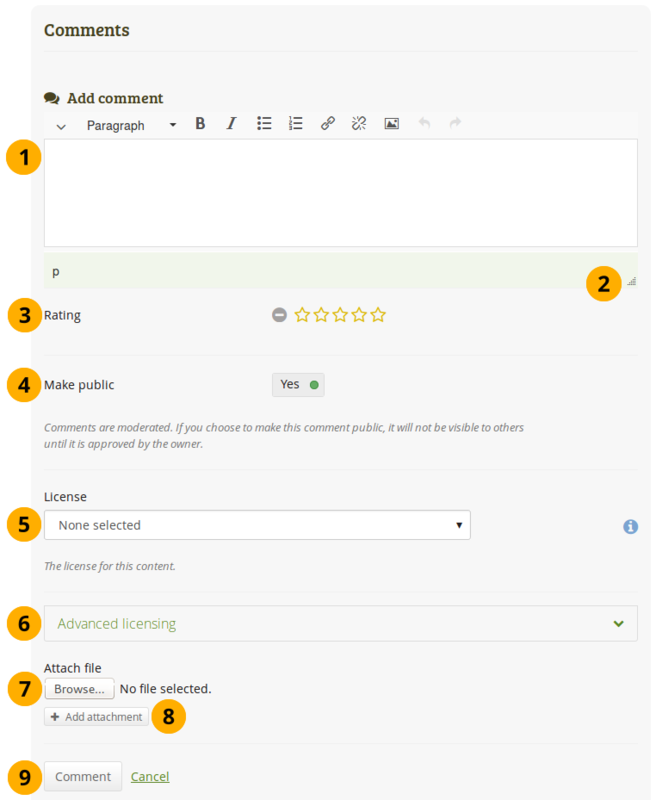 Comment authors can attach a file to their comment to give you longer feedback or oral or video feedback. The files that they add are placed into your personal Files area so you can use that feedback later on.
. The comment text is not displayed anymore. In addition, if you delete the comment by someone else, they will receive a notification about it, which includes their comment text. You can reply directly to a comment when this functionality was enabled for your institution. When you reply to a public comment then your reply can be seen by anyone with access to the page. They also receive a notification about the comment when they had previously left a comment themselves. When you reply to a private comment or reply privately, then only you and the comment author to whom you are replying can see your reply and are notified about it. 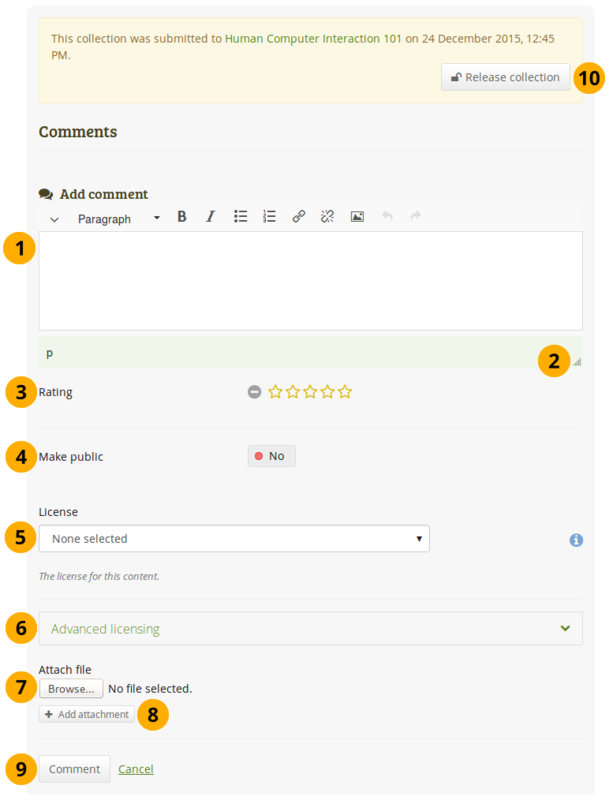 You can edit your own comments, and comment authors can edit their comment if it is the last comment and / or the editing time of 10 minutes has not elapsed yet. If a comment is less than a day old, its time is displayed in seconds, minutes or hours. As owner of a page or artefact, you receive a notification about new comments that have been placed on it. Others will receive notifications if they placed a comment themselves. You do not have to go to the artefact’s details page to view comments left on an artefact. Instead, you can view them directly on a page. You will see the comments directly on the page in the separate modal window. If you have permissions, you can perform certain actions on the comments, such as deleting them or making them public. Click the Close icon to collapse all comments. Click the Add comment link to leave a comment on the artefact’s details page. You can also simply click the Add comment link Add comment at the bottom of the block, and you’ll be taken directly to the artefact’s details page where you can view all other comments. If you want to have all feedback management options available, please click the little Details icon Details at the bottom of the block. That will take you to the details page of the artefact where you have more options available for viewing your feedback. If you do not see “Comments” and / or “Add comment” on an artefact, then you are not allowed to leave comments (anymore). If comments have already been left, you can still view them, but you may not be able to add your own. You can comment on a page and individual artefacts if the page / artefact author allowed that. Add comment: Write your comment into the editor window. At the bottom of the editor window, you see a line that usually contains some letters (in the screenshot that is “p”). That’s just the HTML notation of the current style that you are working in. Click the Window resizer icon to make the editor window larger. Make public: Switch this to “Yes” if you want everyone, who has access to this page or artefact, to see your comment. If you do not make your comment public, only you and the page / artefact author can see it. This setting is switched on by default. License: You see this field if the site administrator turned on license metadata. Choose the license for your feedback. You can set your default license in your account settings. Advanced licensing: You see this option if the site administrator turned on license metadata. If you click it, you see two additional license fields, “Licensor” and “Original URL”, that you can fill in if this is not your own feedback. Click the Comment button to save your feedback or click Cancel to abort your changes. Once you have commented, the author receives a notification about it. Those who comment receive notifications about additional comments made by others after they submitted theirs on portfolio pages when that comment is public. A person leaving a comment is added automatically to the watchlist for the page. When you are not logged in, you can only give feedback on public pages and pages with secret URLs if the site administrator allowed anonymous feedback / comments. Name: You must provide your name to identify yourself. This field is required. Write your comment into the editor window. You have a simple text box available but no advanced editing tools for security reasons and because you wouldn’t be able to use the full image selector. Rating: If the site administrator turned on comment ratings, you can use the 5-star rating scale in addition to your written comments. Make public: Switch this to “No” if you don’t want everyone who has access to this page to see your comment. If you do not make your comment public, only you and the page / artefact author can see your comment. This setting is set to “Yes” by default. Before others can see your comment, the page owner can review it and then decide to make it public or leave private. Click the Comment button to save your comment or click Cancel to abort your changes. Go to the group homepage of the group in which you want to submit a page or collection. You can choose the collection from the drop-down menu under Submit a page or collection to this group. Click the Submit button to lock page content. On the next page you are asked whether you really want to submit your page as your content will be locked at least temporarily. 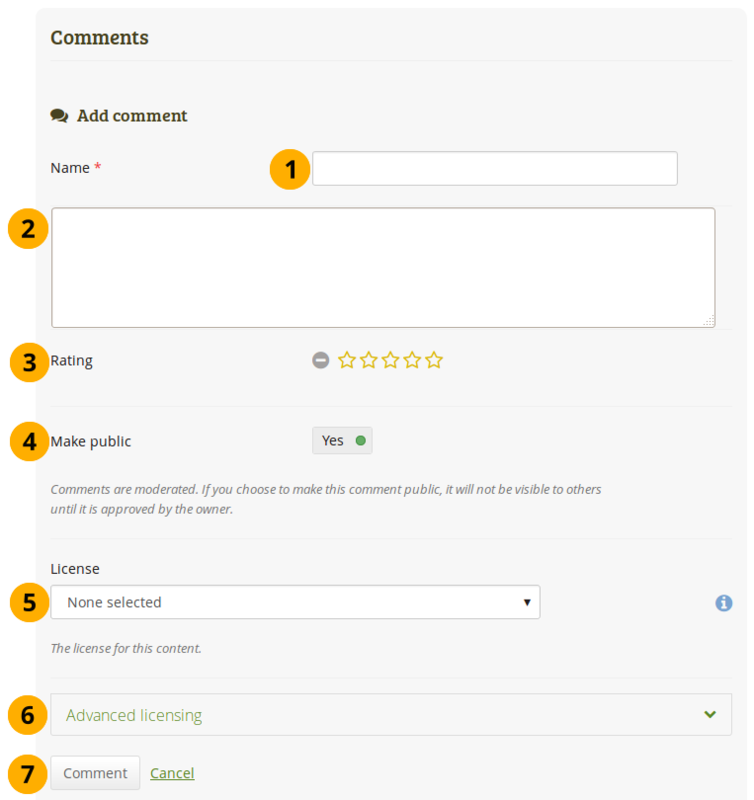 You can also display the page or collection that you wish to submit and click the Submit button right above the comments and the select the group to which you want to submit your work. Go to the page / collection that you want to submit. Right above the Comments section, choose to which group you want to submit the page. On the next page you are asked whether you really want to submit your page as your content will be locked at least temporarily. If you have the role of a tutor or group administrator in a group that allows submissions, you can see all submitted pages and collections with a time stamp on the group’s homepage. Title of the portfolio. This can be either a page or a collection. Owner of the portfolio. You can click the name in order to view the profile page. Time when the portfolio was submitted to this group. Make public: Switch this to “Yes” if you want everyone, who has access to this page or artefact, to see your comment. If you do not make your comment public, only you and the page / artefact author can see it. This setting is set to “No” by default to prevent accidental publishing of assessment comments that should be kept private. Click the Release page / Release collection button to unlock the portfolio for the owner to be able to make changes again.